Choosing the right string type for your guitar and changing the strings regularly are very important because of the effect these have on both the tone and playability of your instrument. It is a good idea to find out what types of strings are compatible with your guitar. Pay particular attention to the method used for string winding, the material the strings are made with and the string gauge. These three features have the most impact on both tone and playability of your guitar. Guitar strings come in a number of different sizes which are referred to as gauges. The number used to describe a gauge means how thick the string is by thousandths of an inch. For example, if your guitar is using a seven gauge string, the thickness of the string is .007 inches. Advantages and disadvantages exist for each string gauge depending on whether they are light or heavy. Advantages. Light gauge strings cause little tension to be placed on the neck of the guitar, which makes them the preferred option if your guitar is of vintage quality. Light gauge strings also increase the guitar’s playability and make it easier to fret and bend notes. Disadvantages. When using a guitar with light gauge strings, you are more likely to experience fret buzzing, which is even more common when the guitar is set to low action. Light gauge strings don’t deliver as much sustain or volume as heavier ones. They are also more likely to break. Advantages. The main advantage of using heavy gauge strings is that higher levels of sustain and volume are achieved. Disadvantages. Guitars with heavy gauge strings have a lower level of playability and need greater pressure from the fingers in order to bend notes and fret. Using heavy gauge strings also places more tension on the neck of your guitar. There are several standard string gauge sets available for acoustic guitars. If you aren’t sure which to buy, try starting with a ‘light’ set which is a readily available option already installed on many guitars. 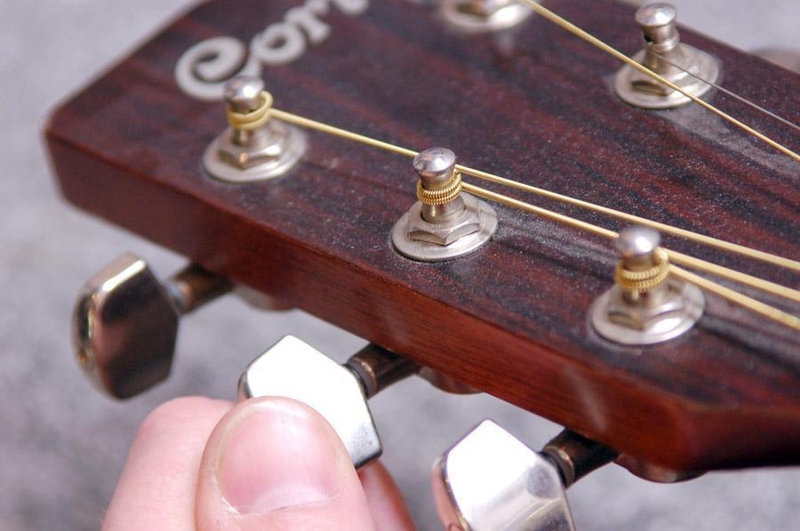 If you tend to break strings easily by strenuous strumming, try a heavier gauge. The following table indicates the standard sizes of the string gauges that come in each set. Modern electric guitars usually have “super light” strings already installed when they are sold. The music type and style that you play can help determine whether you require a set that is lighter or heavier than this. The following table indicates the standard string sets available for electric guitars. Some sets may be slightly different than these based on manufacturer. The tone produced by your guitar is greatly affected by what material the strings are made from because of how each causes the strings to vibrate. Nearly all strings have steel at the core, but the materials used for the windings encasing the core can be made of a number of other materials. Most acoustic guitar players choose strings made of bronze. Although they tend to corrode easily and have to be replaced more often, they offer a bright, crisp tone. Phosphor bronze strings are also bright, and they offer a tone that is darker and warmer than strings made of bronze. Brass strings are bright as well and produce a metallic tone. Strings coated with polymer do not offer as much sustain, which some players suggest is impractical, but these strings last much longer than those made with other materials. Electric guitar strings made with nickel plated steel are very popular as they do not corrode easily and offer strong volume. They also offer a very warm and bright tone. Pure nickel strings also provides a warm, bright tone, although not as much as nickel plated steel strings. Strings made with stainless steel offer a strong “bite” and a bright, clear tone. These strings also last a long time due to their resistance to oxidation. Chrome strings are popular with those who favor jazz music because of their flat, warm tone. Polymer coated strings last for a long time but offer less sustain than strings made with alternate materials. There is no standard answer to how often guitar strings should be changed, but certain circumstances or symptoms can indicate that the time for a new set of strings has come. If the strings appear discolored or rusty, or if you notice that the string wraps are unwinding, it is time to change them. If you find that the tone has become dead sounding or flat, or if you find that it’s difficult to tune the guitar or keep it tuned, new strings could fix these problems. If you tend to play your guitar often or with a lot of picking and bending, you will need to change your strings more often. Frequent tuning changes can also cause the life of the strings to decrease. Playing your guitar around smoke or if you sweat quite a bit when you play, your strings will need to be replaced more frequently. The last guideline for string changing frequency is that if you aren’t sure when the last time you replaced them, then it is probably time. In order keep your strings working their best and for as long as possible, be sure to wash your hands before playing your guitar and wipe off the strings when you are finished. To keep track of the type of strings being used and the last time they were changed, write this information down and keep it in your guitar case. Since guitar strings sometimes break, especially those with a lighter gauge, consider buying bulk single strings, and keep a few in your case along with an extra set. That way you will have them when you need them while saving some money. You may also want to purchase a string winder to quickly and efficiently change strings when you don’t have time to waste.